I would be the first to say the Microsoft’s attempt at bringing singing and Twitter together in this fashion sucked big time…or did it? 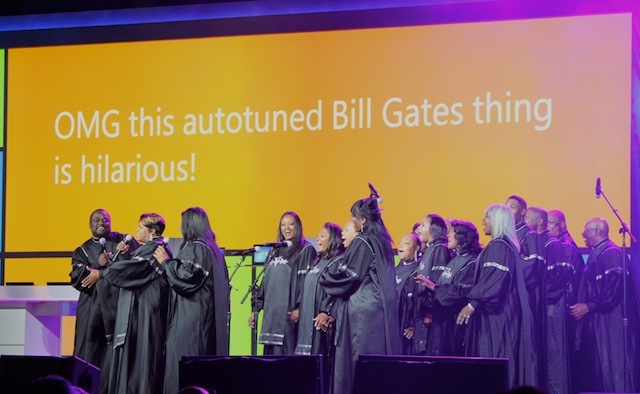 I was in the middle of live blogging the Microsoft CES keynote when Ryan Seacrest (the defacto host for the keynote)n announced and called out the Tweet Choir along with Microsoft CEO, Steve Ballmer. Then the next few minutes after are really hard to describe with words. All I can say is that Twitter should NEVER be included in singing, let alone choirs. Many people (including myself) called the choir a big #FAIL, but is that really true? I predict that this wasn’t that last we’ll see of the Tweet choir. All it takes is a little exposure to spread fame, whether ill-fated or not. Although every part of my being doesn’t want me to say this, I say that the Tweet Choir was a success. Previous Previous post: CES 2012: Kinect for Windows – What is it?